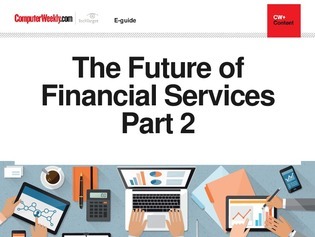 In the second part of our 'Future of Financial Services' e-guide, read about how the financial services industry is not just being shaken up with cosmetic changes, but is about to go through the process of being stripped down and rebuilt. We also feature an interview with a former Google tech lead about how his new company, which already has Lloyds Banking Group as a customer, is approaching legacy replacement at banks. Could it be the nearest thing to banking on Google available today? Some of the big banks are beginning to realise that is what they might need to replace archaic, but reliable, systems if they are to prosper in the future. Not an easy decision. Just look at what happened at TSB - which you can also read about in this e-guide.